Is President Muhammadu Buhari right to suspend Justice Walter Onnoghen and install Justice Ibrahim Tanko Muhammad as Acting Chief Justice of Nigeria (CJN)? This is the â€œpuzzleâ€ the Senate is asking the Supreme Court to resolve. But the APC caucus said it will not be part of the legal journey. Justice Onnoghen is facing charges at the Code of Conduct Tribunal (CCT) for alleged false declaration of assets. The tribunal ordered his suspension. President Buhari obeyed the order â€“ an action that sparked an uproar. The Senate, in a suit it filed yesterday before the Supreme Court, is seeking a reversal of the suspension and the inauguration of Justice Muhammad. The Senate seeks a declaration that Onnoghenâ€™s suspension â€ without a support of two-thirds majority of the Senateâ€ was a violation of section 292(1)(a)(i) of the Constitution. 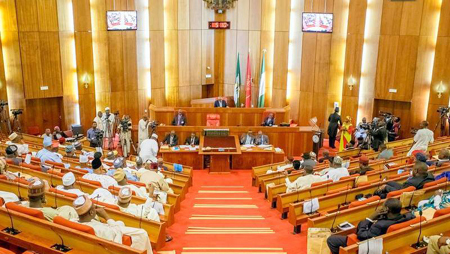 The Senate, in the suit filed for it by Paul Erokoro (SAN), argued that the President could not on the directive of the CCT suspend the CJN without two-third majority of the Senate or appoint Muhammad as as the Acting CJN without Senateâ€™s confirmation. One of the questions is if having regard to section 292 and Part 1 of the Third Schedule to the Nigerian Constitution and section 21 of the Code of Conduct Bureau and Tribunal Act, the President could not â€œsuspendâ€ or â€œpreventâ€ the CJN from performing the functions of his office â€œon the directive of the Code of Conduct Tribunal or for any reason whatsoever, without an address supported by two-thirds majority of the Senate calling for the removal of the Chief Justice of Nigeriaâ€. an order restraining the defendants from continuing or repeating the violation of the Constitution and disregarding the powers of the Senate at the Federal Republic of Nigeria. The upper chamber yesterday cancelled its planned resumption of plenary today. The Senate is also asking the court to determine whether the action of the President amounts to usurpation of the powers of the Senate as provided for in Section 292 of the constitution. A statement by the Special Adviser (Media & Publicity) to the Senate President, Yusuph Olaniyonu, said following the filing of the case, the matter of the suspension of the CJN, which is the main issue for which the Senate had planned to reconvene today, had become subjudiced. â€œTherefore, in line with the standing rules of the Senate not to debate issues that are already pending before the court, the reconvening of the Senate tomorrow (today) has been put off,â€ Olaniyonu said. The cancellation of the resumption was called off in a memo to senators by the Clerk to the Senate, Nelson Ayewor. The Senate leadership had at the weekend summoned an emergency session to consider Justice Onnoghenâ€™s suspension. Tension, however, began to build up shortly after the emergency plenary session was announced. All Progressives Congress (APC) senators and their Peoples Democratic Party (PDP) counterparts started mobilising their members for what was described as a â€œmake or mar sessionâ€. The Senate leadership also held a series of meetings said to have been necessitated by the need to weigh options. But late yesterday, there were hints that the Senate leadership was considering calling off the emergency session to avert possible breakdown of law and order. It was alleged that some senators planned to disrupt the session. The cancellation of the planned session may not be unconnected with the fear that â€œthings might get out of handâ€, a senator told our reporter. There was also an unconfirmed report that some senators planned to move an impeachment notice against the Senate leadership at the session. The statement said the scheduled date of resumption in plenary earlier fixed for Tuesday, February 19, remains. The All Progressives Congress (APC) Senate Caucus dissociated itself from the court action. A statement by Senate Leader Ahmed Lawan said: â€œFor the records, the Senate never met to take such resolution and at no time mandated anyone to approach the Supreme Court on this matter on its behalf.